Ethnographic and anthropological studies such as Prof. Gary Urton's demonstrate that Inka believe systems were inter-related to their view of the cosmos, in particular the way that they observed the motions of the portion of the milky way and planets of the solar system as seen from the Cusco or Qosqo (their capital whose meaning is 'the centre of the earth'). From this perspective their stories depict the movements of constellations, planets, planetary formations, which are connected to their agricultural cycles for a society that relied on cyclical agricultural seasons, which were not only connected to year cycles (as in Europe) but to a much wider cycle of time (every 800 years at a time). This was the main tool to ensure cultural transmission of key information, in spite of regime change or social catastrophes. The Inca myths have been interpreted from a Eurocentric perspectives, this is detached from cosmology and agriculture, depriving of its richness and practical ancient functionality. All those that followed the Spanish conquest of the Inca Empire by Francisco Pizarro burned the records kept by the Inca culture. There is currently a theory put forward by Gary Urton that the Quipus could have represented a binary system capable of recording phonological or logographic data. Still, to date, all that is known is based on what was recorded by priests, from the iconography on Incan pottery and architecture, and from the myths and legends that have survived among the native peoples. Manco Cápac the legendary founder of the Inca Dynasty in Peru and the Cusco Dynasty at Cusco. The legends and history surrounding this mythical figure are very jumbled, especially those concerning his rule at Cuzco and his birth or his origins respectively. 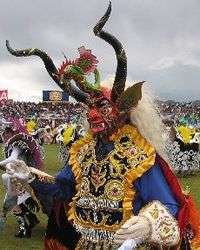 In one legend, he was the son of Tici Viracocha. In another, he was brought up from the depths of Lake Titicaca by the sun god Inti. However, commoners were not allowed to speak the name of Inca Viracocha, which is possibly an explanation for the need for three foundation legends rather than just the first. There were also many myths about Manco Cápac and his coming to power. In one myth, Manco Cápac and his brother Pacha Kamaq were sons of the sun god Inti. Manco Cápac, himself, was worshiped as a fire and sun god. In another myth, Manco Cápac was sent with Mama Ocllo (others even mention numerous siblings) to Lake Titicaca where they resurfaced and settled in Isla Del Sol, Bolivia. According to this Inti legend, Manco Cápac and his siblings were sent up to the earth by the sun god and emerged from the cave of Puma Orco at Paqariq Tampu carrying a golden staff called ‘tapac-yauri’. They were instructed to create a Temple of the Sun in the spot where the staff sank into the earth to honor the sun god Inti, their father. During the journey, one of Manco's brothers (Ayar Cachi) was tricked into returning to Puma Urqu and sealed inside, or alternatively was turned to ice, because his reckless and cruel behavior angered the tribes that they were attempting to rule. (huaca). Apocatequil (aka Apotequil) or Illapa was the god of lightning. Ekkeko was a god of the hearth and wealth. The ancients made dolls that represented him and placed a miniature version of their desires onto the doll; this was believed to caused the user to receive what he desired. Illapa ("thunder and lightning"; aka Apu Illapu, Ilyap'a, Katoylla) was a very popular weather god. His holiday was on July 25. He was said to keep the Milky Way in a jug and use it to create rain. He appeared as a man in shining clothes, carrying a club and stones. He was formerly the main god of the Kingdom of Qulla after which the Qullasuyu province of the Inca Empire was named. Kon was the god of rain and wind that came from the south. He was a son of Inti and Mama Quilla. Mama Pacha (aka Pachamama) literally translates to "mother nature" and was the most important figure in mythology, second only to the Sun. She was the wife of Pacha Kamaq, a dragon, and a fertility deity who presided over planting and harvesting. She caused earthquakes. Mama Sara ("maize mother", aka Saramama) was the goddess of grain. She was associated with maize that grew in multiples or were similarly strange. These strange plants were sometimes dressed as dolls of Mama Sara. She was also associated with willow trees. Wiraqucha was the god of everything. In the beginning he was the main god, but when Pachakuti became Inca emperor, he changed this god's importance, pointing out that the most important god was Inti. 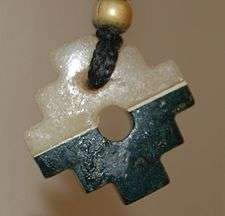 Chakana (or Inca Cross, Chakana) is - according to some modern authors - the three-stepped cross equivalent symbolic of what is known in other mythologies as the Tree of Life, World Tree and so on. Through a central axis a shaman journeyed in trance to the lower plane or Underworld and the higher levels inhabited by the superior gods to enquire into the causes of misfortune on the Earth plane. The snake, puma, and condor are totemic representatives of the three levels. The alleged meaning of the chakana symbol is not supported by scolarly literature. ↑ Roza, Greg (2008). 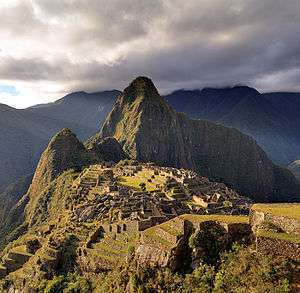 Incan Mythology and Other Myths of the Andes. The Rosen Publishing Group, Inc.
↑ Heydt-Coca, Magda von der (1999). "When Worlds Collide: The Incorporation Of The Andean World Into The Emerging World-Economy In The Colonial Period". Dialectical Anthropology. 24 (1): 1–43. ↑ Steele, Richard James (2004). Handbook of Inca Mythology. ABC-CLIO.